I can’t believe I am going to share this with you. There is so much that goes on behind the scenes of creative entrepreneurship that I don’t share because I don’t think it will be helpful. I often advise clients, and try to take my own advice, and only share what I think will help you. I focus on writing things that solve problems, and ease pain. I know my stories and experiences have a place within that, but I do put the focus on serving. Sometimes the lines get blurry. I share as much as I can about my simplicity journey, my health, habits, and my life. I thought I was being completely transparent with my work too, but I haven’t been. I don’t share as many lows as highs, and there are just as many or more. I don’t share the struggle I have in deciding what to share, what to create, and how to show up in the most authentic way for both of us. When I start to articulate it, the words sound like whining to me, and neither of us have time for that. Then again, maybe it’s helpful for you to know that I don’t have it all figured out. I want to be here for you (more than you know), and I want to be here for me too. I want this work to light me up every single day. While I love writing articles that are easy to consume in neat bullet points, telling you exactly how to clean out your closet, or simplify your finances, and I genuinely feel grateful and blessed to be here doing this, there is something about this work that I love more. What really inspires me to come back to the blank page are the times when I know my words, and stories are moving you. Moving you to tears, laughter, connection, or action. Because when that happens, that’s when I know I’m really showing up for the right people, and that I am creating from a place of genuine connection with my heart and soul. It’s an honor that I can not fully express in words. This is what I wasn’t going to share with you. I am writing my heart down to create a book I love, and one I hope you will love too. It’s about what I compromised in my life to have more money, stuff, and status, and how things changed when I realized that wasn’t working. It’s the book about how simplicity brought me back to love, and how it can bring you back to love too. I definitely wasn’t going to share this part … I started writing at the beginning of the year, and by March, I changed the direction of the book so it could fit into the self-help section of your local bookstore. There were still pieces of my story in the book, but lots of recommendations and action steps too. It got messy. I got stuck trying to figure out how a book mostly about me could be about you too. How could my story solve problems and ease pain? People told me a self-help/personal development book would sell better if I skipped the memoir part, and I listened to them. I spent months of time, energy, and other resources writing something that will never see the light of day. Looking back, I see that I stopped writing down my heart. I lost myself trying to create something that I didn’t really want to create so it would fit in somewhere it didn’t really belong. I stopped writing down my heart, and eventually, I stopped writing down the words. When you live or work outside of your heart, there will always be a breakup, a breakdown, or both. I’ve been coming back to the book I really want to write, and have been very inspired by memoirs that move me like This I Know by Susannah Conway. I think about books like Cheryl Strayed’s Wild, or Eat, Pray, Love, that I love curling up with again and again. I’d never think of those books as “self-help” and yet they’ve helped me in so many ways. Most of those voices are my own of course, but there are outside voices from the present and the past too. I’d love to say that I am done listening to them and I’m just going to write the book, but all I can say is that I’m not going to listen to them today. Today, my heart is going to show up and lay down in the form of ink on paper. Why did I hold back? I didn’t tell you about the book before because I didn’t want to let you down. I wanted to finish it and tie it up in a pretty package before I told you what I wanted to make. I told my husband, family and close friends and when the book stopped going somewhere, I felt like I let them down. I had to tell them it wasn’t working, and that didn’t feel good. Guess what happened though? Instead of showing disappointment, they showed me love. They saw my struggle, but they didn’t see failure. I trusted them with my pain and they lifted me up. I held back because I was afraid, but the people I love showed me that the only way to be lifted is to let people in. You’ll have to tell me. Does sharing my struggle help you with yours? 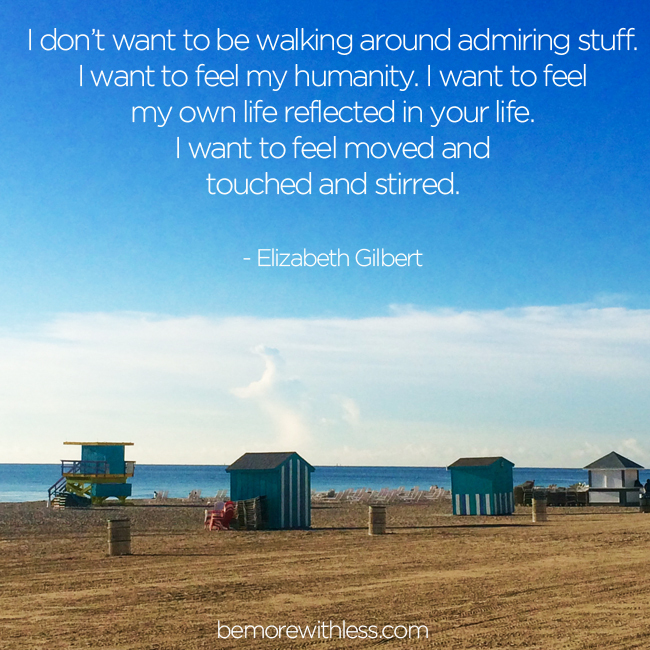 I want it to help you live and work the way your heart wants you to live and work even though the voices, inside and out, will tell you otherwise. I want it to help you know that you are not alone in your struggle to express yourself creatively, or to make decisions for your health or family that you aren’t sure are going to work. I want it to remind you that we never figure it all out, and unless we keeping coming back to the very core of our being for answers, we will never have clarity. Most of all though, I want to demonstrate that I care and that I understand, that I know you, because I am just like you. Our stories might be different but our hearts are very much alike. Let’s take care of them. Ooooh! I think your story will touch so many. All our struggles are different, but when we read about how others live their lives it helps us live our own more authentically. It’s so good to hear about the struggles and the successes because it is what truly makes us all human. The squirrels bury their nuts and don’t care about where. Humans care, dream, hurt, love. I know your book will be the book that only you can write! I cannot wait to read your book! I am so glad you are stepping into your truth more and more every day. And sharing this here with us is a true act of generosity and boldness. Thank you for claiming your leadership from a place of love. That’s the take away for me. Well put and very true. Please do not stop sharing your story with us! Your perspective is so genuine and your honesty is refreshing. And I love how you keep bringing it back to the heart: “When you live or work outside of your heart, there will always be a break-up, a break-down, or both.” This is so true, and so easy to forget. So thank you for the reminder. I am sure that writing a book isn’t easy, but I commend you for staying true to yourself throughout the process and sharing it with all of us! I have been hoping for another book from you! I CAN’T WAIT TO READ IT!! This post brought me to tears….. The struggle you describe so clearly is also mine – which I bury carefully hour by hour. I am unwinding a 35+year career/business, literally emptying out the file cabinets today. A lucrative, respectable business that brings me no satisfaction – in exchange for a new career path for which I have no background and is far less glamorous. I stumble, I waffle, I bear the comments of how crazy the new idea sounds – such that I seldom mention it. So I know that urge to show oneself as a polished offering to world – particularly when you know how nice the reception is. Good for you!!!! I admire you so much for making the change and applaud your courage!!! Any nay-sayer is just jealous they don’t have the nerve you do!! All the best to you!!! Hi Courtney! Thank you so much for writing this. I’ve felt so lost in a lot of ways this year as my writing took a back seat to life and other projects. Lately I’ve been feeling like I have things in my heart to say but I wasn’t happy with any of my current online platforms. This morning on a whim I went back to look at Twenty-one Delights – the blog I started during Spark and Tinder but lost steam on, and I realized that I was writing from the heart there from day 1 and that maybe that’s the place I should write again. I’ve had such a hard time figuring things out and it’s comforting to hear you have those struggles too, especially when you’ve built such a wonderful blog and business. Thank you for sharing your struggle with us! And I can tell you, even if it helps no one else, it helped me. It was just what I needed to hear today. So thank you. Oh, my goodness, reading what you are going through gives me a mirror to see my own struggles and if your solution to having light in your life might work the same to provide illumination and chase away the darkness for me and even in the dark, you step outside and there are millions of pinpoints of light shining down on us. I find your writing so helpful in my own life, that I do not have to know exactly how everything will turn out, it is the trying that is important because if I do not try , then I am not truly living, just existing. I would love to read your memoir. At this point, I’m tired of self help books. I just want to read a book that uplifts me and learn a nugget or two from. Keep us posted. I agree! I love memoirs, learning through others brave stories and experiences. Keep at it Courtney!! As Sasha said, I would love to read your memoir. I find I am drawn more to the memoirs of people I find inspiring than to self-help books. And the more of the process, the struggle, they share with me, the more helpful and inspiring I find them. Because it is in the struggle that I recognize myself. So, thank you for sharing this part of the journey on the blog today, and I look forward to your book. Courtney, I’m so glad I’m a subscriber. The past year has been one of many changes, but mainly the beginning of simplifying journey. We recently made the decision to move back to Southern California from Ohio to be closer to family. We moved her for my boyfriend’s job. It’s just not working out as he’d hoped. He lives to work. The hours are long and the pay is inadequate. His health is suffering and it’s affected our relationship. It was a no brainer when he told me he didn’t think he could stay in his job for another year. We are moving back to be closer to our families and friends. During this time, I have been scaling back on stuff, and our move is great time to get really down and dirty with that aspect of simplifying. I was so proud of the 2 car loads of clothing that left our house in the past few weeks. I think of all the trips I could have taken if I had only purchased 2 pairs of jeans instead of 15! And the coats and shoes…oy oy oy! I had a recruiter contact me yesterday about a position in San Diego that would be the next logical progression in my profession of the past 15 years. These jobs don’t become available very often, and when they do, they don’t often pay at the level of experience they are looking to fill it with. But this one does. When I learned the pay grade, I immediately started plotting my strategy to land this role. But I went home last night feeling extremely conflicted. I’ve spent the past 6-8 months planning my departure from this career as it’s fast-paced, deadline driven, and frankly, I’m burnt out. I just don’t have a passion for it any longer. I love my coworkers and the relationships I’ve made throughout my career, but the work literally means very little to me. So much that work ethics have waned significantly and I don’t feel good about the work i’m putting out there any more. But I will admit, those dollar bills were enticing. This had the potential to be my first six-figure salary. But when I got home and started talking to my boyfriend about the potential, I could feel the stress level rising. The company is a fast-growing startup that has the words “fast-paced” “stressfull” and “plenty of overtime” written all over it. I was glazed over with the thoughts of being able to afford the area of San Diego we really want to live (as opposed to moving 40 minutes inland). I’m still struggling with the fact that I feel like I’m supposed to want this job, and the promotion, and the money and oohs and aaahs that will come from family, friends and peers if I could actually land it. But in my gut, I really don’t want it. I don’t want the stress. I don’t want the long hours. And I don’t want the resentment that comes with making plenty of money to live a lifestyle that I really won’t have time to enjoy. I only know this because of my last position in the same field that left me with only 4 days off in one work year. Even though I’m struggling, i’m going to leave it behind me. I’m going to go with my gut and move one with plans for simplifying my career, along with the rest of my life. I’m going in a completely different direction. It’s new and scary, like thinking about this high-paying opportunity in front of me. But the difference is that the new direction actually excites me. I don’t have that pit in my stomach. The one that leads to stress, depression and whole host of other health issues. So thank you for being the constant reminder to reign me in. Though I’m not doing it as efficiently or as timely as I would like, I am making great strides in being more with less. And today was a big one. Run Danielle Run! You know in your heart the money, the accolades and admiration won’t make up for precious time in your life doing something that is no longer your passion. Good luck and thanks for sharing your journey. Courtney, this is so wonderful and courageous and helpful in so many ways; thank you so much for sharing. I think each and every one of us needs a reminder like this to not listen to the “not good enough” voice. I would love to read your memoir just as I have enjoyed your blog. I think when you write from the heart, but without ego, it comes through as empathetic and genuine, and that is what helps people. Best wishes to you in your ongoing writing and life. Ohhhhh this helped me a lot. Just knowing that you struggle and take winding paths (I wouldn’t say wrong, because didn’t you learn something valuable? ), like me, is very helpful and inspiring. I do like to read about the lows and struggles because as much as I love the picture of you as a wise and knowledgeable person ahead of me on the path, I also like to know that we wrestle with the same questions and take similar wandering paths. It’s so good to hear that if you stay true to yourself and your heart, even if it isn’t what conventional wisdom and advice suggest (or is the exact opposite), things work out better. That’s something I’ve felt myself for a long time, even if I don’t always go with my gut. I can’t wait to read your memoir! Yes it helps!!! I started a book a couple months ago and it’s my 16 year old son that lit the fire back up! I’ve taken your courses, I do self study, I’ve had a blog for four years now and embraced minimalism 8 months ago and STILL it seems like I’m never “there”. Seeing people who (it seems) have things come so easily makes me wonder what in the world is wrong with me??!! Now I know we aren’t all good at everything and I also understand that we all struggle, but it feels less alone out here when you pony up the information. One thing YOU told me was to be very genuine and real and honest when I write. I’d been only partially all of those things – more a sin of omission – because opening up is vulnerable and scary. But I did it, because I believed you were right and it was worth it. Because I can quit my job and live my minimalistic lifestyle making a living writing? No. Not yet anyway. But because it’s made a shift in ME and in how people respond. We want to hear not only the good but the bad and the ugly. Not to think, “Oh, I knew that Courtney wasn’t as good as she made it sound!” but because we think “Thank GOD Courtney is human and now I can embrace me being more human because she was unafraid to share herself”. Which is also why I started doing it. If I feel that way about you, others can feel that way about me. Thank you!!! Keep on sharing from your heart! I appreciate your honesty and your vulnerability. Your words have impacted many of us in ways you don’t even realize. Thank you for writing this and sharing your struggle. It is all too easy to think that other people have their lives all together and don’t waste time leaving the path and getting caught in the brambles. I’ve spent a lot of my life trying to think of what other people want and need and then trying to fit my life to fit their expectations (funny thing, though, is that I never ask them what they want…I just give them what I think they want from me). Doing this just leaves me further from the path I should be following … a path without the brambles, because aren’t all those thorns that are making me struggle telling me that I shouldn’t be going that way?! Congratulations on listening to your heart. It can be so difficult with so many voices around us. I enjoy learning through reading the memoirs of others, and am now looking forward to reading yours. Hugs. People love people who are honest! Now a days, so many people put on a front and you never get to see who they really are or what’s going on beneath the surface. So thanks for sharing this post and writing a memoir. Courtney, your post has hit a tender spot in me and I found myself tearing up as I read it. When I stopped to see what chord your words struck in me, I realized that it was your vulnerability. I am beginning to understand that I have some work to do in this area. The more vulnerable/authentic I can be, the more authentic my relationships will be and I am craving that in my life today. So, thank you for putting yourself out there AND I would definitely read your memoir. Stay true to your heart. Thanks for sharing the challenges of laying out your heart and it’s ways; it’s a motivation to keep doing the same. Courtney-I have always felt a certain warmth from your posts, a genuineness that already felt fairly transparent. As a small business owner I have felt very much alone at times without comraderie from others. I have to do it all, be it all and present myself and my shop to the public in a positive way no matter how I feel on the inside. I can’t be too transparent. So reading your blog and others, and also just what other people have written in the comments always helps me feel like I’m not alone. There are many who feel the same way for different reasons. It makes me realize I need to reach out more to friends, colleagues, and post more on some private Facebook groups I’m on as I have experience to offer but also support I can receive. You can do no wrong by sharing your heart with others. I believe that’s where the sweet spot lies. Yes! Your every post inspires me and I’m thrilled you’re writing a book! Thank you for sharing your struggles. It helps me feel like I’m less alone with struggles that I too don’t express as often as I should – for fear of complaining. This is exactly what I needed to hear today. Thank you!!! I too am struggling to write a memoir. It will be a historic memoir based on the letters I wrote to my wife while serving as a helicopter pilot in Vietnam. I am currently working my way through my daily letters, reliving the experiences and emotions of early 1972 to produce a single typed script which I will then wrestle into a coherent narrative and hopefully publish. It may not make it that far, may never be published or see the light, but having the type script for my children and grand children is important. And that’s really who I’m writing for. Someday, it might be important to them. Good luck with your memoir. I look forward to reading it. Thank you for your service. What a treasure your writings will be for your family. If they are published in public, I would certainly read them as well. All the best to you. I’m glad you’re writing your memoir–that’s something I would LOVE to read! Everybody has a story to tell, something unique to tell the world. Based on what I’ve seen here and on Facebook, I’d bet it will be delicious! Thank you for sharing, Courtney. Looking forward to reading your book! Thanks Courtney. Can’t wait to read your book! I too try to focus on how I can be helpful to others in my blog, but can’t help posting my struggles, as well. Life isn’t perfect and we’re all doing the best that we can. I think hearing about the highs and the lows makes us more relatable, and ultimately, MORE helpful to others. Good luck and, as always, thanks for sharing. You have been and continue to be such an inspiration to me! I started a blog, have been leaning into minimalism, developed a self care routine, am working out, meditating and eating well, and I’m working on an exit strategy for a job that doesn’t bring me joy! I can’t thank you enough!!!! Your story matters. And it is by hearing the stories of others that we all come to find the true stories of ourselves. If your book describes how you came to the realization of what was really important to the life you wanted to live – and what you gave up to make it happen – it will be exactly what a lot of us who are still struggling to figure it out really need to read. I’m looking forward to your book! Sometimes we are so focused on not being a failure, being perfect and not letting people down, that we lose sight of the journey. Your post was beautiful and honest, I thank you for that. Maybe it wasn’t time for the book, but it was time for you to share. Thanks so much for sharing this. I really admire your candor, and I can’t wait to read your memoir! The courage it took to tell all of us this proves that your book is still in you and it’s waiting to be birthed into this world. Be gentle with this baby and yourself and when it’s time we will love it just as much as you do. Keep writing girl, you are an inspiration. Hearing about your struggle and the path your family and friends helped you find through their love is sweet and touching and brought tears to my eyes. I agree with what others have said — I’m more interested in a memoir than a self-help book. I also loved Eat, Pray, Love, and Wild (and I recently finished Tiny, Beautiful Things). I put “This I Know: Notes on Unraveling the Heart” on my to-read list. I’m so looking forward to your book! Thank you for sharing this Courtney! Sending you a big hug of encouragement, support and love. I am grateful for your words everytime I receive a new blog post. I’d much rather read a memoir. Thank you for sharing your heart, soul and ideas. This is vulnerability at it´s best, Courtney. Love it! Courtney, you have inspired me a lot – for years! Lately I’ve been looking for inspiration with writing and something I pinned was a beautiful quote by Stephen King: “If what you are writing is not for yourself, it won’t work”. Similar advice has been popping up all over the place: ‘you have to like it.’etc., etc. And how about: “If you can’t put your whole heart in it, take yourself out of it.” wise words but by whom at this moment I can’t recall. You haven’t wasted any time at all – try to remember that! You learned a big lesson and you shared that lesson with so many people already. Remember what Leo has to say about accountability partners. It helped you put the work in, and now you know you need to edit. That doesn’t mean it was all for nothing. Perhaps you’ll use it for something else. Perhaps you just had to go through it to see that it is not where your heart and purpose are. I too listen to the negative voices far to much and am working really hard to fight them off. I’m sure people will love YOUR book! (despite what those catering for what they believe is an established market may think; let other people fill that hole). You have an inspiring story, a compelling way of writing and a friendly, but not scared to be vulnerable air which is real and connective. The people who need you will find you. Just be you – you are great! This bit Courtney, “They saw my struggle, but they didn’t see failure. I trusted them with my pain and they lifted me up”. I think anybody who has done creative and personal work in public can relate to your feelings here. Thanks for sharing, Courtney. Looking forward to reading your memoir! Hi Courtney. I thoroughly enjoyed today’s post. I love reading the comments, also. I save your email notices every time because I may want to return to any one of them and re-read them. Like others before me, I really love this quote: “When you live or work outside of your heart, there will always be a break-up, a break-down, or both.” I just posted it on my Facebook status and a link to this blog post. Thank you so much for your honesty and I know that your memoir will be very inspiring for all of us. I have been following you for several years and never commented, but do so now because reading your posts reminds me how to be human, caring, and true to my heart when my job and life pushes me to act in ways that are counter to what I believe. You are my dose of what it means to be true to your core values and how to live by them. Thank you for sharing this honest post. I am SO GLAD to hear that you are writing a book! Both Be More With Less and Project 333 have helped me GREATLY. I took a lot of your posts and put them in a MS Word document, so that I could read them when I am offline. I have been thinking, I sure wish she would write a book – and you ARE! I will be one of the first ones to buy it. KEEP WRITING! Thank you SO much for having the courage and authenticity to admit when and how and why you got “off track” – it is honest and brave and what all of us always need to hear! We all compare our insides to others’ outsides, and as a result second guess ourselves and think that we are the only ones struggling and falling and failing and getting back up. Thank you for your honesty! I would LOVE to read your memoir, I love self-help books and don’t think of myself as a “memoir reader,” but I also love Wild, and Eat, Pray, Love….you write here with the same kind of honesty, humor and self-reflection, I cannot wait to read your memoir (and I also understand completely trying to “fit yourself into the self-help box”). In any case, thanks for sharing your writing journey and allowing us to learn from the detour and the return to your original calling. It sounds like you are on a good path again. No matter how the bookstore categorizes your work, I will be happy to read it. Wishing you all the best, and thanks for making such a positive difference in my life. I heard discourses from those fear-filled voices, as recently as yesterday. It feels different when they’re talking, and they’re so persuasive it can be hard not to believe them. I’ve started telling them to shut up and mentally swatting them away like some little devil on my shoulder. They’re not my authentic voice. Your blog post today reminded me of a time when I wanted a dream so bad that I ignored the obvious signal of bad advice from one I was about to enter into a contract with. Luckily, my parents’ counsel showed me where it all was going to blow up in my face if I didn’t stop the dreaming and do the math. I was able to exit that contract with no losses but embarrassment and gained a good education on who not to trust in the future. It will be yours and it will be you speaking to us as you often do, sincerely, with that tender brand of honesty you possess that uplifts even as you reveal your pain. Please keep writing. There are many that want to read it. First off, I want to say how this quote – “When you live or work outside of your heart, there will always be a break-up, a break-down, or both” – jumped out at me! The old V-8 slap in the head, helping me realize the reason why my relationship with my man has been suffering for last three months. I have not been living in my heart – thank you for this revelation! Secondly, never feel like you can’t share the bad and the ugly with us, as well as the good. If a friend or a client came to you posing the question of should I share this, I am confident you would tell them “of course!” I look forward to reading whatever book you end up writing, whether it’s a memoir or the memoir has morphed into something else. When I read your blog I cut and paste so much of your wisdom, I am sure the story of YOU will enlighten and inspire as well! Enjoy the process!! Thank you, Courtney. It’s silly, when I see your emails come in, I begin to dream about the quiet moments I’ll reserve to read each word. This week, it’s Friday night, a few hours after the kids are asleep and the house is clean. It’s kind of like my reward! I’m blown away. You’re so brave and thoughtful, inviting us in to comment on something so personal and meaningful, thank you. All of these words matter and I’m grateful to hear you stumble too… and that we’re in this together. I’m so thrilled that you are focused again on your memoir… already dreaming of the quiet moments I’ll reserve to read! Thanks for the reminder not to sacrifice anything unless it’s for love or work we love. Taking that with me. Thank you very much for your sharing. Struggles and failures bring us far further then only success. It is also natural to have struggles. I am looking forward to reading your memoirs. The last I read which touched me very much was the book by Amanda Palmer: the art of asking. Maybe also one for you to read, if not yet done. Listen to your gut. Write the book you want to write. Have courage. Move forward. These things alone will inspire. Another Barbara chiming in. The memoir is my favorite genre and I rarely read a self help book. I like to read about the real life challenges, opportunities, struggles, joys and decisions made by different people. Your book will be a reflection of you and not something written to fit into a marketing niche. That may be why it didn’t work for you. It wasn’t the book your heart wanted to write. Time spent figuring out what we DON’T like or want is just as valuable as time spent figuring out what we do want so you didn’t waste your time. Good luck! I can completely understand your silence on the subject, it is often best to keep quiet when the future is uncertain. Too many of us speak without thinking and later say things that we regret. For the last two months we have stopped blogging while a move to another town has occupied our thoughts, feelings and energy. It has been more than we were ready cope with, yet life moves on, even if the story must come later. Can’t wait to read your book when it is ready! I don’t know much about anything, but I think it’s brave of you to stop and re-evaluate what you’re doing and why, and I’d rather read something by another human being, not an air-brushed superhero. Thank you. Oh my goodness, yes, of course reading your story helps me! Good for you Courtney, for returning to your heart. I look forward to reading your memoir when it is finished. In the meantime, I continue to be inspired by you, and SOMEDAY I will have the courage to turn my back on those tantalizing dollar bills so I can focus more truly on my own heart. I totally get this, Courtney. I’ve found when my stories are not coming from my heart, they fall flat. Then I have to go back and see where and why I checked out. Often it’s because I wasn’t being brave with my gut feelings for the book. My beta readers and editor pick up on those spots too and call me out on them, giving me the courage to go back and dig deep to get to the good stuff. Hang in there, friend. This memoir will be beautiful. I just never got the popularity of Eat, Pray, Love. I really struggled to finish it. But I love your blog and I’m sure your memoir will be a winner. Good luck with it. This sounds incredibly familiar and I have thought this time and time again. I often think if I tell someone about a project and it falls through, or I go in another direction, then it’s a failure. But if I don’t tell anyone and the project is never finalize, then no one has to know. However, this reasoning doesn’t account for all the support and energy I get from talking about my projects to others. I too have a memoir of sorts in the works, but I have not touched it since the beginning of the year. I’m always more inspired around NaNoWriMo in November so I’m hoping to pick it up again. This year I also started writing my travel blog and abruptly stopped when I adopted a dog. Now that things are a little less hectic I hope to continue. All this to tell you YES, your article helps. It’s encouraging to know we’re not alone, people going through the same thing make it less scary. It’s motivating to hear you are struggling and yet you’re not giving up. It’s also a reminder of the projects that are near and dear to my heart. Your comment left me a little befuddled, because at first I thought it was a reply to mine, and I wasn’t expecting a reply let alone a suggestion for a skype date from anyone. And then I realised you were addressing Courtney. A few years ago I would’ve hidden away in embarrassment, but today I’m taking it as an opportunity to say I really appreciate your work as well and I’ve put your book on my Christmas list. And I’ll take a tablespoon of that encouragement, thank you! Wishing you well in your future endeavors. I think it is wonderful that you are sharing this story. Authenticity and honesty are what we need more of and I, for one, am inspired by your bravery.